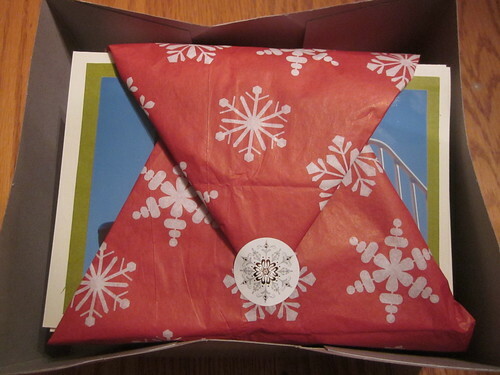 Two years ago, I ran a fall article series on homemade gifts, which I then gave out to relatives that Christmas. Naturally, some of the gifts were bigger hits than others. After the series was over, I gave some thought as to the amount of effort I put into the gifts in exchange for how happy they made the recipient, and I came to the conclusion that six of the items would be worth doing again with respect to the effort involved and how much people enjoyed them. Here are these six gifts. If you start on Thanksgiving weekend, you can make all of these before Christmas. 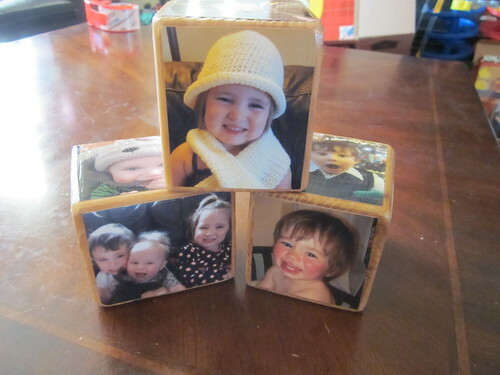 These photo cubes still adorn the homes of the people we gave them to. The process was pretty straightforward. We went to a local lumberyard and had them cut a 4×4 board (which actually measures about 3.5″ by 3.5″) into 3.5″ pieces, making several (approximate) cubes. We used sandpaper to smooth the faces a bit and round the corners of the cube. We then printed out six pictures per cube, cut them into squares, and glued them to the cube faces. After that, we applied several layers of Mod Podge (a simple-to-apply finish that you can get at many hobby supply stores) to each cube that we made, then applied a final layer of spray sealant to keep the cubes from having a “tacky” feel. Each cube took perhaps two total hours of effort to complete, with some of that time overlapping if you make multiple cubes. See the full photo cube post for more details. 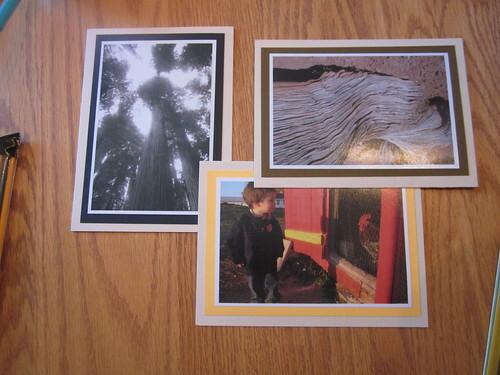 These personalized photo cards have been both cherished by the recipient and sent through the mail as note cards. Again, the process here is simple. Get some completely blank 5″ by 7″ note cards and some construction paper or colored art paper. Cut the paper into 4.5″ by 6.5″ rectangles and affix them to the front of the cards with some form of adhesive (I used double-sided tape with a bit on each corner). Then, get a stack of 4″ by 6″ prints of photos that you like and affix those photos on top of the rectangles (again, with double-sided tape on each corner). These are fun to wrap as well. We took pieces of tissue paper, folded them nicely around the cards, put a sticker on to hold the tissue paper in place, and used a garment box for the outside covering. The entire process took perhaps two hours for a batch of 35-40 cards. Obviously, you can use any type of photography you want. Grandparents might appreciate photos of grandchildren. Others might like nature pictures or cityscapes. You can choose photographs and colors based on what you think the recipient will enjoy. See the full personalized stationery post for full details. This was a pet project of Sarah’s. We’ve seen family members wearing the product of these efforts many times. It only took Sarah eight or so hours to finish these, most of which was spent on the couch with a good movie on the television. Sarah recommends starting with this tutorial to learn how to crochet. If you want to make the exact hat shown in the picture, here’s that pattern. 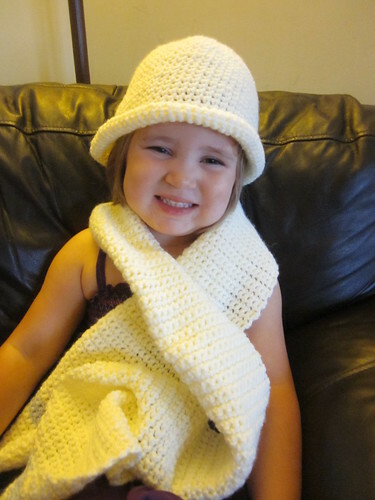 There are many scarf patterns and hat patterns freely available online. All you need is some time, a crochet needle, and some yarn. Sarah estimates that each scarf and hat takes about four hours to make, but she does have at least a little experience crocheting. If you’re not familiar with how to crochet, there’s no better time to learn. See the full crocheted hat and scarf post for more details. We’ve seen these used as kitchen decorations and also used as meals. We’ve also heard compliments on how it made a delicious meal or snack for the recipient’s families, and they didn’t take long to make, either. There are many meals out there that can be prepared out of mostly dried ingredients – soups, brownie mixes, and so on. You can make a wonderful gift by taking one of your favorite recipes of this type, collecting all of the dry ingredients together, and putting them in a jar, which ideally leaves the recipient only having to add water, stir, and cook. All you really need is a recipe, the ingredients for that recipe, a glass jar to hold it (with a lid, of course), and perhaps a few additional items for decoration (we used squares of cloth, a ribbon, and some card stock for a handmade tag). 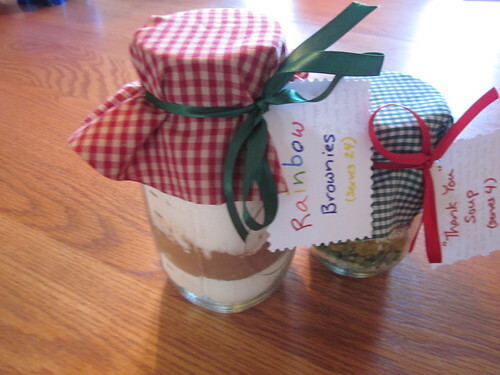 Just add each ingredient to an appropriately sized jar, close the jar up, and decorate it. Be sure to include a note explaining what’s in the item and what steps still need to be taken to prepare it as a meal. See the full meals in a jar post for more details. Our wine jelly was enjoyed by several different families. I actually ended up passing along this post to several different recipients who wanted to make it themselves. All you need is an afternoon to make quite a few jars. You don’t need much to make these jars. You’ll need the usual canning items: a large pot, six jars with lids and rings, and something to pull the jars out with (we bought a plastic “bucket” for fifty cents from a local store that works great). 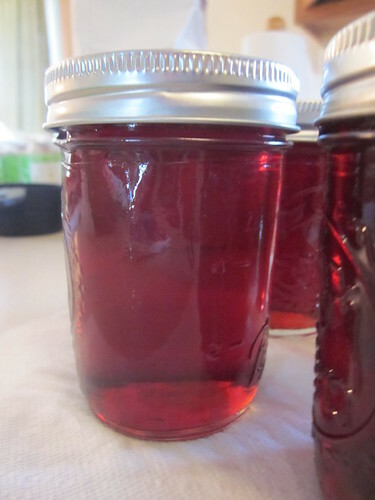 For this jelly, you’ll need 3 1/2 cups of wine (this will take a little more than a bottle, but you can use grape juice to make up the difference if you don’t want to pop open a second bottle), 1/2 cup of lemon juice, one package of dry pectin, and 4 1/2 cups of sugar. Just mix together the jelly ingredients in a pot (mix the wine, juice, and pectin first until it’s boiling over medium-high heat, then add the sugar slowly while stirring rapidly) and boil for another minute after the sugar is all added. Ladle it into the jars (that have been boiled in water for cleanliness) with half an inch of breathing room on top, close them with the lids, and put the jars into a boiling water bath for five minutes. Let them sit out to cool and you’ll have wonderful gifts. See the full wine jelly post for more details. If you’re going to make this one, you need to start right away, but you only need two of the items to get started: vanilla beans and vodka. The rest can wait. This process makes some of the best vanilla extract you’ll ever try. To package the extract, you’ll also need some food-safe bottles, which you can order online at a reasonable price. The ones we used were eight ounce bottles with screw-top lids. We also printed off our own labels, as you can see. So, how do you make it? The first step is to head to eBay right now and bid on some bulk vanilla pods. Buying them individually is cost prohibitive, but you can get lots of pods at a very cheap price if buying them in bulk. Also, hit your local liquor store and get a bottle or two of inexpensive vodka (you don’t need the expensive stuff here). When you get the beans, slice eight (or so) of the pods lengthwise so the beans are exposed, then drop the whole pods (beans and all) right into the vodka bottle. Close the bottle up, shake it, and store it in a cool dark place. Shake it every day or so. After three weeks (or longer – I’d wait until the last day or two for this), take out your bottle and filter it using a pair of coffee filters over the top of a jar. Just pour the extract through so that you filter out the beans and any pieces of the pod. 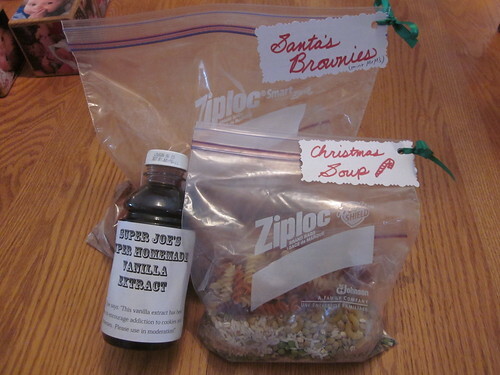 Put the extract into the food safe bottles you have, affix the labels, and you have a wonderful homemade gift. See the homemade vanilla extract post for full details. Our family and friends loved these gifts and put them to good use over the past two years. Each one can easily be made before Christmas, particularly if you get started this Thanksgiving weekend. Each one is relatively low cost, too, compared to purchasing anything similar, plus these have a wonderful homemade quality about them.